PRINCE is such a sweet cat! 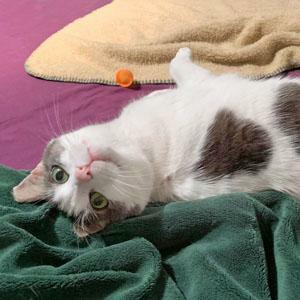 All he wants is a nice, warm, loving forever home to call his own! Prince is a big grey and white kitty. He has soft white fur and loves to be brushed. 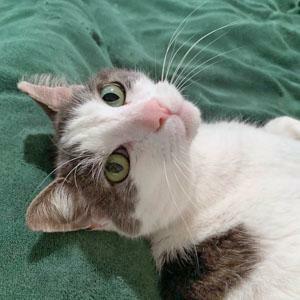 He also loves being petted and purrs up a storm when he sees you, when he's sitting or lying next to you and just about any time he's happy and feels loved. Be prepared for a LOUD purr motor! Prince is very sweet and adores people. He's also a little timid and still getting use to his foster home. He hides when he hears loud noises, but quickly comes out when his foster mom tells him all is well. 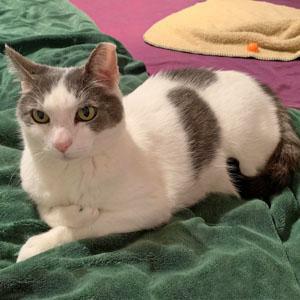 Prince needs a quiet home with a patient caretaker who will give him a couple of weeks to slowly settle in. Once he feels safe, he's your loyal, loving companion. 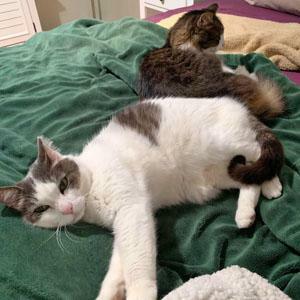 Prince initially adapted right away to the other foster cat, Fluffy, in his foster home. However, Prince has become a bit dominant and now Fluffy is a little afraid of him. So we now think Prince will do best as the only cat. As Prince is settling in and becoming more comfortable, he is getting playful – liking to bat toys around. He also likes one catnip toy he can grab and kick with his back legs. Prince came into our care after we were contacted by a kind woman who had been feeding him outdoors. She had seen Prince hanging around outside her ground-level apartment and discovered, after talking with neighbors, that Prince use to live in her apartment and was abandoned when the previous tenant moved. Hard to believe a person would be so cruel to just leave this sweet cat outdoors to fend for himself!